University of Notre Dame alumnus Norbert Wiech founded Lysomics LLC to manage the clinical development needed to bring to market a promising new treatment for people with Niemann-Pick Type C (NPC) disease. FDA support is being sought for early clinical exploration of an approved drug to fight this rare disease that has no cure or treatment. Lysomics is based on the work of Notre Dame professors of chemistry and biochemistry Olaf Wiest and Paul Helquist, and Frederick Maxfield at Cornell University’s Weill Medical College, to find treatments for NPC. NPC disease is a rare, fatal neurodegenerative disease that primarily strikes children before and during adolescence. With support from the Ara Parseghian Medical Research Foundation, researchers from Notre Dame and Cornell University have demonstrated the effectiveness of small molecule histone deacetylase inhibitors (HDACi) in correcting the NPC phenotype in human patient cells by increasing expression of the NPC1 protein. NPC, a genetic disease, affects fewer than 100 people in the United States, and an estimated 20-40 who are in the early stage of the disease could benefit from the treatment. Most patients die by the age of 16, and few survive beyond 25. The disorder prevents their bodies from processing cholesterol, which accumulates in the brain. Vorinostat is most effective in the early stages of NPC, although it could improve quality of life for older patients. The effort will benefit from the 30-year-old Orphan Drug Act, which helps development of treatments for conditions that affect fewer than 200,000 people in the United States. The federal law grants exclusive marketing for seven years after FDA approval, tax credits of 40 percent for clinical research expenses, grants for studies up to $200,000 per year for three years and a waiver of a high filing fee. “Lysomics from the onset was a not-for-profit operation,” said Wiech, the company’s CEO. “You can’t get a drug approval unless you’re a company. A company has to be structured, so it can handle the data and do all the piles of paperwork that are required to go through this.” After approval, the drug will need no marketing because parents of children with NPC will be eager for access to the treatment, he said. 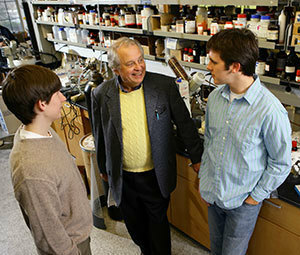 Originally published by Gene Stowe and Marissa Gebhard at newsinfo.nd.edu on November 30, 2012.